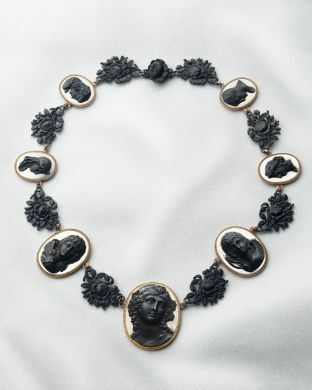 Between 1796 to 1806 the Prussian Royal iron foundries produced a fine lace-like jewellery made out of moulten iron and black laquer. Prussian Citizens were encouraged to donate their gold jewellery to aid the war effort against Napoleon. In exchange for their donation, they would receive the intricate ironwork jewellery, which was often inscribed with the statementGold gab ich zur Wehr, Eisen nahm ich zur Ehr (I give gold towards our defence effort and I take iron for honour). In 1806 Napoleon conquered Prussia and took the patterns from the foundry to Paris, where he resumed ironwork production. Using the same tactic that was used against him, Napoleon asked his citizens for gold in exchange for Berlin Ironwork. Berlin Ironwork jewellery, which was formerly only worn in mourning, thus became a symbol of patriotism and freedom on two sides of a war.